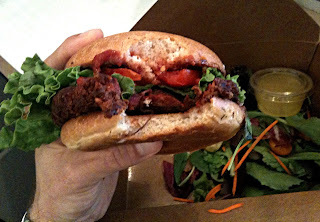 Maybe my expectations were too high, but I'd heard enough of my friends extol the virtues of the Plant Burger -- including going so far as to call it the best veggie burger in SF!! -- that I finally tried it and was significantly underwhelmed. I think the Golden Beet Loaf sandwich at Atlas Cafe, for example, is a similar but much better sandwich -- but maybe I just had a bad taste in my mouth from being forced to go to the Marina. I think it looks pretty dang delish.